Click the "Share" menu label at the top of the main window. Select this command to share the currently active calendar over your local network. The Sharing tab of the Calendar Properties window will be displayed, enabling you to specify the default permission level and optionally override the default for specific Windows usernames. After sharing a calendar, other users can select the "Add Shared Calendar From Local Network" command to add the shared calendar to their Calendar Lists, if they have permission to see the shared calendar. 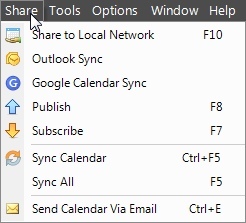 The keyboard shortcut for sharing a calendar to the local network is F10. Selecting this command will configure the currently active calendar to be synced with Outlook. This is done via the Outlook tab in the Calendar Properties window. For best results, before selecting this command, ensure a calendar of the same name already exists in Outlook. or create it if necessary. Calendars synced between VueMinder and Outlook must have exactly the same calendar name in both programs. This command is compatible with Outlook 2010 and later. Earlier versions of Outlook won't sync correctly, if at all. Also, Outlook Express is not supported. Selecting this command will configure the currently active calendar to be synced with Google Calendar. This is done via the Google Calendar tab in the Calendar Properties window. This command will display the Publish tab Calendar Properties window for the currently active calendar, where publishing settings can be viewed or defined. The keyboard shortcut for accessing the Publish Calendar window is F8. This command will display the Subscribe tab of the Calendar Properties window for the currently active calendar, where subscription settings can be viewed or defined. The keyboard shortcut for accessing the Subscribe to Calendar window is F7. This command will synchronize calendars that are shared with Microsoft Outlook, Google Calendar, or the local network. For calendars that are shared with Outlook and also published and/or subscribed, the subscription update will happen first, followed by Outlook synchronization, and then the calendar will be published. This enables VueMinder to effectively publish Outlook calendars to wherever you'd like, or to update Outlook calendars from any iCalendar source, including those on secure servers. The keyboard shortcut for syncing the current calendar is F5. This command will synchronize all calendars that are published, subscribed, or shared with Outlook, Google Calendar, or your local network. This is equivalent to performing a Sync command on each calendar, except it is done as one operation. During the operation, the status bar will update to show the current status. After the Sync operation completes, the status bar will indicate "Ready". The keyboard shortcut for syncing all calendars is Ctrl+F5. This command will be visible when one or more events are selected in the Calendar View. This will save the currently selected event(s) to an iCalendar (.ics) file, which will then be attached to a new email using your default email client. This will only work if you have an email program (such as Microsoft Outlook) installed on your computer. Multiple events can be sent at the same time by Ctrl-clicking the events you'd like to email. This command will be visible when a calendar is selected in the Calendar List. 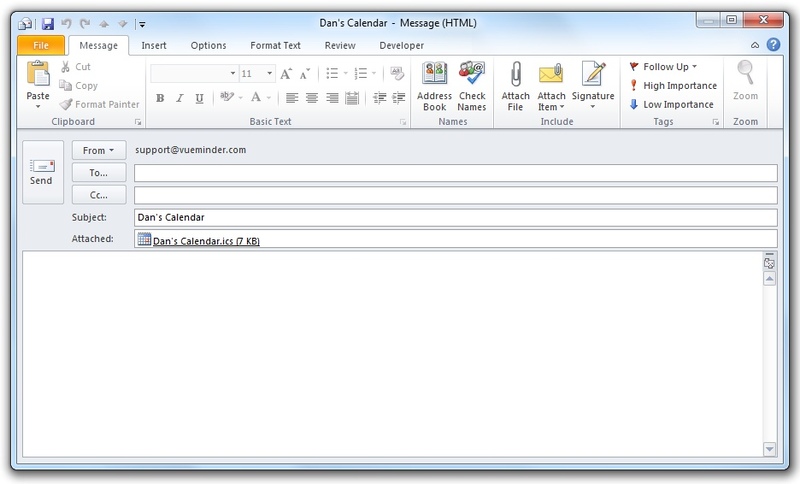 This command will save the currently selected calendar as an iCalendar (.ics) file and attach it to a new email using your default email client.